Specially formulated for use right from day one, Mustela Bebe Multi-Sensory Bubble Bath is ideal for cleansing your child&rsquo;s delicate skin while stimulating his senses. &nbsp;Thanks to its new formula enriched with Avocado Perseose, a patented ingredient of natural origin, Mustela Bebe Multi-Sensory Bubble Bath reinforces the skin barrier and preserves its cellular resources. Features: Gently cleanses the skin without leaving it dry, thanks to marine oligo-elements and gentle surfactants. Silky foam, blue color and fresh Mustela fragrance help awaken your baby&rsquo;s senses and promote his well-being. Formula does not sting the eyes. 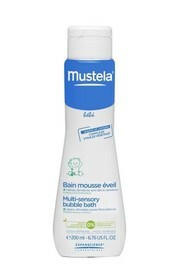 Directions: Pour a little of the Mustela Bebe Multi-Sensory Bubble Bath into the tub while the bath is running. Rinse off bubble bath before drying. &nbsp;Multi-sensory bubble bath can be used right from the day your baby is born.